Various technological revolutions have delivered a boost to economic growth, but also notable bifurcations. One such bifurcation has been the development of wage incomes between lower and higher non-routine-based skilled jobs (Goos et al. 2014). Another has been in profits growth between incumbent firms and new digital entrants. Yet a third bifurcation has been in economic growth between some developing countries unable to catch up, and other more developed economies (Bagchi 2005). As artificial intelligence (AI) technologies become more effective and are rolled out across economies, it is important to assess how their diffusion will affect different economic stakeholders – whether they will lead to convergence or divergence, more or less divides. There are clearly fears among the public and expressed by some prominent economists that new smart AI-based technologies will start to replace many jobs (Arntz et al. 2016). Another often-heard debate is whether digital platforms will create superstar firms (Ayyagari et al. 2018). A fact base is needed to ascertain whether these fears hold true, and whether the developments on which these fears centre – divergence, for instance – is good or bad for our economies. After all, divergence may induce significant re-allocation of resources. This may be painful in the short term, but may be a major source of prosperity growth in the medium term (Forbes 2000). To take one example, consider employment. 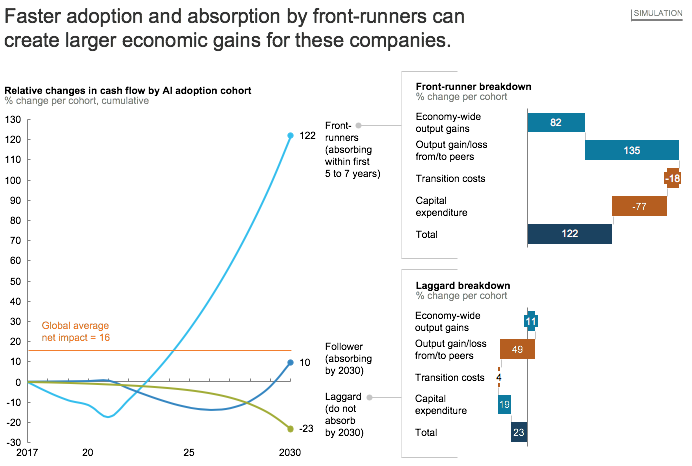 Previous MGI research demonstrated that a key driver of employment at the firm level is the elasticity of substitution between capital and (automatable) labour, as well as the demand shift due to new competitiveness gained by firms adopting AI. The impact on employment is the net effect of AI of those two effects (Bughin and Hazan 2017). Early adopters of AI have been found to be expanding output significantly through AI, casting some doubt on whether employment will decrease. Additional new research from MGI has confirmed that early adopters are boosting output more than they are substituting some contestable repetitive tasks (Bughin 2018). In new MGI research, we leverage a series of independent global corporate surveys to simulate the likely impact of AI dynamics on economies, and look at the likely distribution of growth in profitability, labour incomes, and GDP (Bughin et al. 2018). The calibration is based on detailed econometrics of firm adoption of AI technologies, how the absorption of those technologies leads to new productivity gains, and how they affect change in firm decisions in capital and labour. We further add a macro-loop: how productivity gains from AI are reinvested in economies, and how reallocation of resources suffers from transition costs such as reskilling, temporary unemployment allowances, and organisational development costs at the firm level. Our findings suggest that an AI divide may open up on three levels: individuals (workers), companies, and countries. For each group, there is no inevitability that these divides will be sustained given incentives and global resources to rebuild convergence in the medium term. From a socioeconomic and policy standpoint, there needs to be an emphasis on the right level and timing of management of the transition to the new economics of the future. AI divides: Which ones and why? The first divide we looked at is that among firms, given that corporations are the major sources of labour and capital decisions, and of trade exchanges. As we have noted, companies that adopt AI rapidly are likely to grow their profits faster than productivity growth. Using a joint model of firm adoption of AI, profit growth, and capital and employment decisions, we find that, on average, total GDP growth will average 1.2% a year, or a upside of 16% of added value by 2030, compared with today. However, leading-edge, innovative companies that adopt and absorb AI throughout their organisations could increase their economic value (economic output minus AI-related investments and transition costs) by 122% by 2030. Those that do not adopt could experience a decline in their cash flow of about 20% (Figure 1). Note: Numbers are simulated figures to provide directional perspectives rather than forecasts. The key drivers of this AI divide are threefold. First, using a model of production task automation the labour share is reduced (Acemoglu and Restrepo 2018). Second, competition and business stealing plays a role, and is empirically the largest driver of herd behaviour in the corporate adoption of AI technologies in our econometric estimates. Third is a selection and endowment-bias effect – early adopters have structural advantages in shifting the productivity frontier as they tend to be larger, multiproduct firms (‘scope effects’), which are already more digitised than other firms, and can therefore leverage technology ‘complementarities’ such as cloud and big data, two of the building blocks of AI insights. The second divide is in skills. Independently of where people work in winning or losing firms, demand for labour shiftsaway from repetitive tasks towards those that are socially or cognitively driven (Manyika et al. 2017). Another shift visible in our data is a shift towards digital skills embedded in tasks of work. Wage differentials alsorise, as these are the net result of productivity gains versus displacement. For low digital skills and repetitive tasks, the displacement effects are typically larger than productivity gains. However, for highly cognitive, more interaction-based skills with a large digital endowment that will be in high demand, the wage bill will increase. The wage bill ‘divide’ compounds with the firm divide, of course. Finally, an AI divide may appear among countries. Countries that establish themselves as AI leaders (mostly developed economies) could capture an additional 25% upside in GDP by 2030, compared with today, while a group of – mostly emerging – economies may build up only an extra 5% to 15% upside. In fact, we find clusters of countries, reminiscent of the literature on convergence clubs (Quah 1996). They are multiple reasons for this divergence. First, a key driver of adoption of AI and automation technology is the productivity gains linked to the substitution of tasks by smart capital. In our estimates, this amounts to roughly 40% of the economic gains for the average country. Clearly, the existing structure of tasks in the economy as well as its relative price of tasks versus smart capital leads to a lower economic case for AI based on labour automation only. Second, on other factors such as innovation, human average skills to complement AI capital, and digital maturity, developing countries’ current foundations are weaker than in developed countries (Guillén and Suárez 2005). Policy factors can add to such economic factors. For instance, China is challenging the US in the race to supply AI as part of its aggressive, long-term AI strategy. Those divides are neither necessarily bad, nor permanent. In general, reallocation of resources will play its role, with struggling firms exiting the market, for instance. There are also forces that will make convergence work towards a reduction of these divides. For instance, companies adopting AI will not only reduce certain skills as they automate; some other skills will be needed to complement AI. The new skills needed to operate AI are already in short supply at least in some OECD countries (OECD 2016). Companies may then be incentivised to complement education through continuous learning. Equally, developing economies are not destined to lose the AI race. They can choose to strengthen the digital foundations for AI and the enablers needed to reap the potential of AI, and be proactive in accelerating adoption. The fact that AI divides may open up, coupled with the fact that, in the short term, the benefits of AI may not be visible and there will be disruption and transition costs to absorb, may be sufficient to create a backlash against adoption of these technologies, despite their significant potential long-term benefits. MGI’s research suggests that AI’s contribution to growth may be three or more times higher by 2030 than it is over the next five years. Not only an ability to manage the transition effectively, but also patience and vision will be needed to deliver on the GDP growth promise of AI. Acemoglu, D and P Restrepo (2018), “Modeling automation”, MIT working paper. Ayyagari, M, A Demirguc-Kunt and V Maksimovic (2018), “Who are America’s star firms”, World Bank Policy Research Working Paper 8534. Bughin, J (2018), “Why AI is not the end of jobs” , Sloan Management Review, 24 May. Bughin, J and E Hazan (2017), “The new spring of AI- a few early economics ”, VoxEU.org, 21 August. Bughin, J, J Seong, J Manyika, M Chui, and R Joshi (2018), Notes from the frontier: Modeling the impact of AI on the world economy , McKinsey Global Institute. Goos, M, A Manning, and A Salomons (2014), “Explaining job polarization : routine-based technological change and offshoring”, American Economic Review 14. Guillén, M F and S L Suárez (2005), « Explaining the global digital divide: Economic, political and sociological drivers of cross-national Internet use”, Social Forces 84(2): 681-708. Manyika, J, S Lund, M Chui, J Bughin, J Woetzel, P Batra, R Ko, and S Sanghvi (2017), Jobs lost, jobs gained: What the future of work will mean for jobs, skills, and wages , McKinsey Global Institute. OECD (2016), Getting skills right: assessing and anticipating skill needs. Quah, D T (1996), “Empirics for economic growth and convergence”, European Economic Review 40.